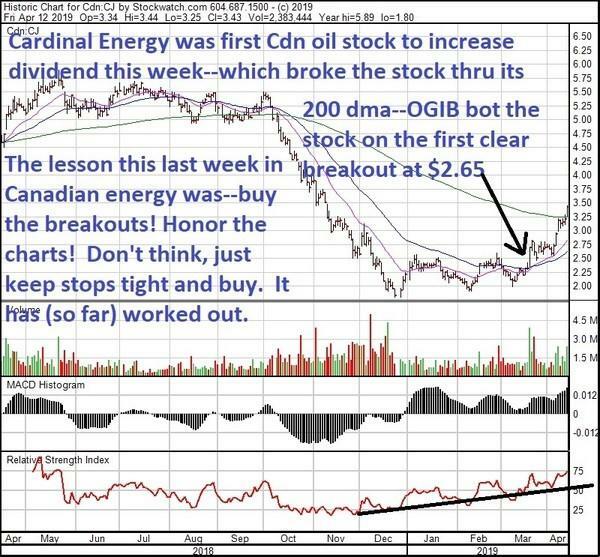 There is now a "catch-up trade" underway in Canadian energy stocks — and they should outperform US oil stocks in 2019. Heavy oil prices in Canada bottomed at US$10/b in late 2018, and now they are over US$50! Nobody thought that would happen so quick. Natural gas prices will stay low, and maybe even go lower in 2019 as LNG prices around the world are collapsing – threatening a very important relief valve in US. 2. Regime change in Alberta and Ottawa – the left wing New Democratic Party will almost certainly get defeated in this Tuesday’s election. And the federal election in October is now a toss-up – only 6 weeks ago I would have bet you a steak dinner that Prime Minister Justin Trudeau would get re-elected with a majority. 3. Natural gas prices will stay low, and maybe even go lower in 2019 as LNG prices around the world are collapsing, threatening a very important relief valve in US pricing. As I’ve said many times, there is no such thing as an “oil producer” in the United States – they ALL have much higher natural gas weightings (due to deeper geology) than Canada, and that will mean much lower realized pricing in the coming quarterlies for US producers. Several Canadian oil producers now have Free Cash Flow ratios that would make them world leaders in almost ANY industry – and the Market is now willing to see through the political clouds and take a chance here at ridiculous valuations – I mean two and three times cash flow. 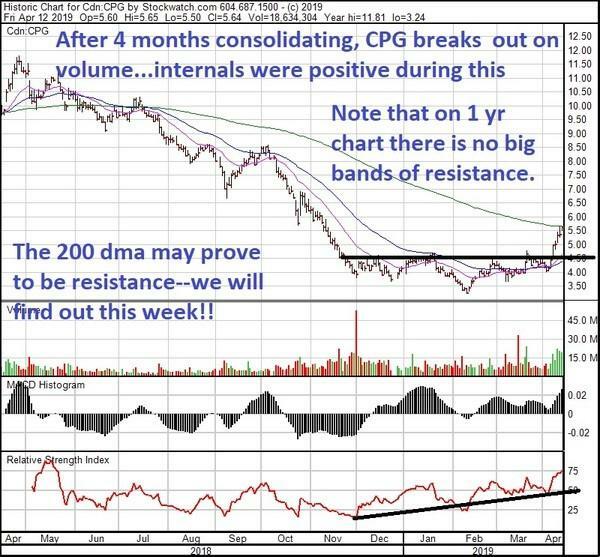 I told my premium subscriber group on our bi-weekly Wednesday call – when charts start to perform like this sector-wide, what’s really important is – don't think. Respect the charts and buy (mostly) the larger cap players who are so cheap they could still double (both by deleveraging and getting a multiple increase) and some (just a little bit) of the more volatile juniors that have lower quality shareholders (almost all retail, no institutional) and will go down in price a lot more when the chart starts to consolidate or when a small bit of bad news hits. 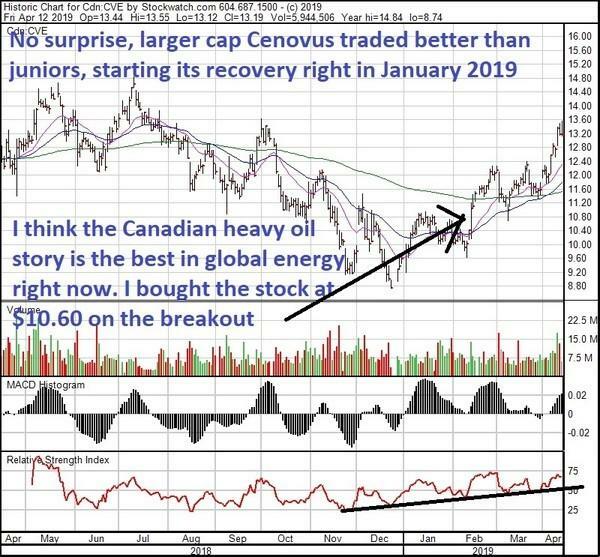 Only a few short weeks ago, I never thought I would say this – but I think Canadian oil stocks will outperform US oil stocks in 2019. Additional disclosure: The Oil and Gas Investments Bulletin is a team of writers. This article was written by Keith Schaefer, Editor/Publisher. We did not receive compensation for this article, and we have no business relationship with any company whose stock is mentioned in this article. The author of this article has no positions in any stocks mentioned, and no plans to initiate any positions within the next 72 hours.